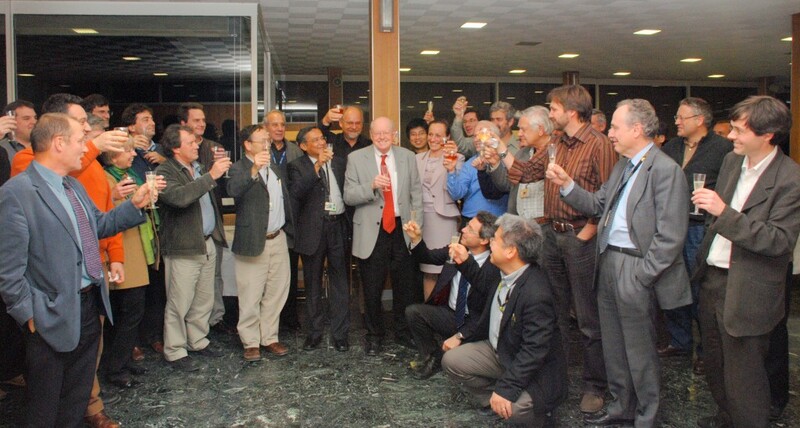 A toast to Alan Costley and a half-century of contribution to fusion physics. 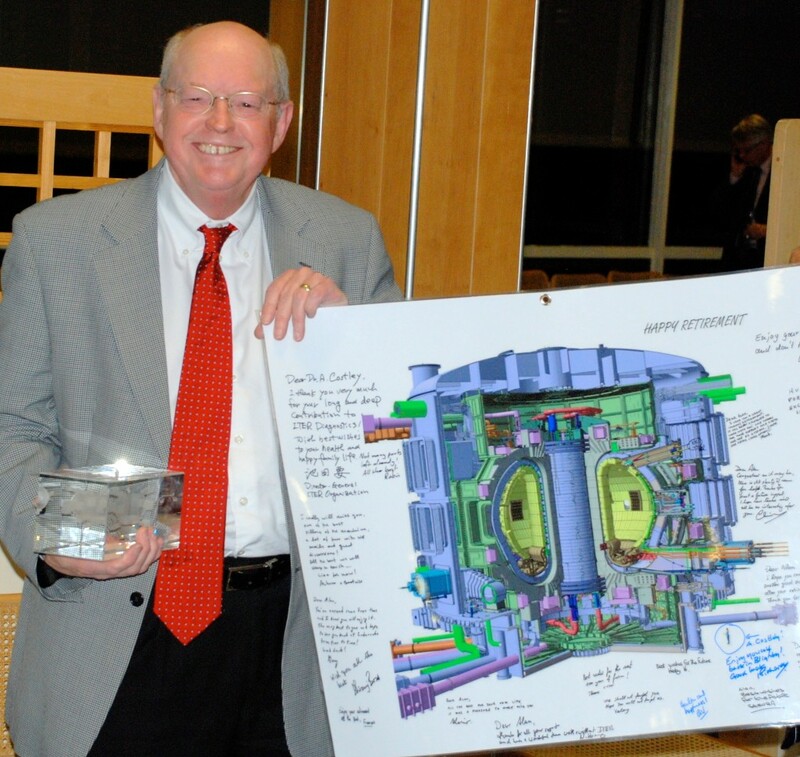 A signed poster of the ITER Tokamak and a ten-kilo paperweight containing a miniature ITER—diagnostic systems included!—will accompany Alan on the next round of his adventures. This week, the ITER community will be saying farewell to one of its most senior members, Diagnostics Division Head Alan Costley, who is retiring after nearly five decades devoted to physics. He is author of over 250 scientific papers on plasma diagnostics and measurement science, including approximately 40 invited papers at international conferences, and was elected a Fellow of the American Physical Society in 2008. "I'm not sure I like the word retirement," Alan cautioned in a recent interview with Newsline. "Pipe and slippers are not for me ... I prefer to think of retirement as a transition to another state of activity. I have a full scheme of things planned for the years ahead, including remaining available to help the ITER Project in any way that I can." It's no wonder Alan isn't ready to come to a full stop; he's worked continuously for 48 years. Science has always been his passion—at 7 he listened to weekly radio shows on science, and as a teenager (if it has to be told) he read physics textbooks on the beach when on holiday. He lived only a few miles from the world-calibre National Physical Laboratory (NPL); when school ended at age 16, NPL hired him as laboratory assistant. "I loved my first exposure to the laboratory environment," Alan recalls. "I remember hearing the scientists talk amongst themselves. I couldn't understand a word, but it was very exciting to me!" Alan biked back and forth to work, while pursuing night courses. At 18, he was awarded a Ministry of Science and Technology scholarship to study applied physics and mathematics at university. He continued at the NPL in a work/study arrangement, each time sampling a different area of research. When he was introduced to plasma diagnostics after college, his career took a definitive turn. "In fusion science, the knowledge flows through the diagnostics," says Alan. "Diagnostics are the window to the knowledge, and that's why they're such fun to work on!" Alan discovered a new way of measuring plasma temperature and its variations within space and time, and developed the instrumentation with his own hands. His technique was called ECE, for Electron Cyclotron Emission measurements. "With ECE," Alan recalls, "the physical phenomenon of the plasma could be explored with new clarity ... it was a veritable explosion of information on what was happening inside the plasma. I was very fortunate." Alan was awarded PhD based on this work, and the Charles Vernon Boys' Prize from the UK Institute of Physics for distinguished research. His technique interested physics labs around the world; over the next years, Alan travelled to implement ECE at the TFR Tokamak in France, T10 in Russia; Alcator at MIT Boston, DIII-D in San Diego, and DITE in Culham. Now a recognized specialist in the field of plasma diagnostics, Alan joined the JET development effort in 1983, with responsibility for the diagnostics systems to measure plasma temperature and density. In 1994, he moved on to the greatest challenge of his career: developing a sophisticated array of plasma measurement diagnostics for the ITER Project. "Diagnostics in ITER represent a tremendous scientific and technological step forward ... a step some five orders of magnitude beyond what has been done in any previous device," emphasizes Alan. He worked for five years at the ITER Joint Work Site in San Diego, eight years in Naka, Japan, and for the last three years in Cadarache, France—a total of 15.5 years with ITER. At Cadarache he has built up the Diagnostic Division, in his words "a talented, dedicated group of individuals who will lead the preparation of the system for ITER." Dr. Michael Walsh, from Culham and JET, will be taking over from Alan as Head of the Division. Alan looks forward to retirement as a time for "reading, thinking and writing." He'd like to conduct personal research on diagnostics for the next-stage device after ITER. "But," he concludes, "ITER will continue to have first call on my time!"